The slowest season of the year at Biltmore brings the best deals. Admission is lowest of the year at $45/adult when you buy on the Biltmore Estate website 7 days in advance on many weekdays January-February. 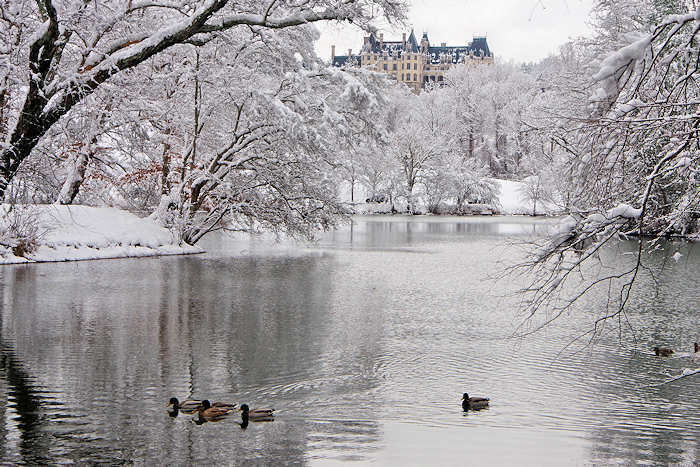 Save $10 on other days when you buy on the Biltmore Estate website 7 days in advance. Children 9 & under always get free admission. The Inn on Biltmore Estate: Save up to $100/night! Book now online. Village Hotel: Save up to $75/night. Book now online. Annual Passholders save even more in January & February. Lowest rates are midweek. Call 1-866-336-1245 to book. February 8-May 27, 2019: Each winter for the past several years, Biltmore has debuted a new costume exhibition inside the House. 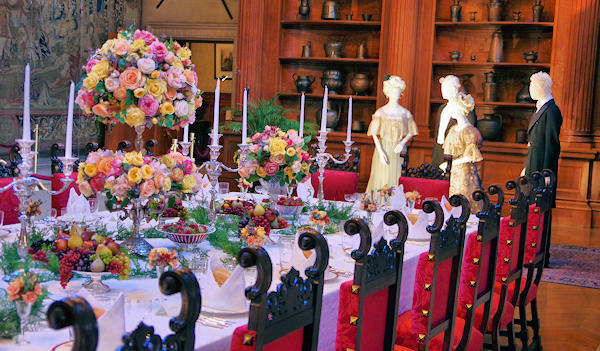 In 2019, see an extra special clothing collection, A Vanderbilt House Party: A Gilded Age, displayed throughout the grand rooms - match with spectacular floral designs. Through audio storytelling and elegant clothing meticulously recreated from archival Vanderbilt photos, hear and see fascinating stories of how they entertained guests. Read more. Morning: Arrive at the Welcome Center to pick up your tickets and watch the orientation video for a great introduction. Drive the two mile drive to the house. The Welcome Center opens at 9 AM every day. Arrive at the Biltmore House. Enjoy a leisurely self-guided tour of the largest home in America. Take advantage of the clear winter days for photo ops and beautiful views from the South Terrace. As always, weekends are busier than weekdays. And check out the interesting guided specialty tours. Lunch: Rejuvenate with a hearty lunch for two at the Stable Cafe, located beside the house in the restored Stables. The café features slow-cooked rotisserie chicken, fresh salads, and irresistible desserts. And browse the shops. Afternoon: Stroll acres of peaceful winter gardens designed by America's foremost landscape architect, Frederick Law Olmsted. From the house, take a maze of walking trails to enjoy the peaceful scenery. 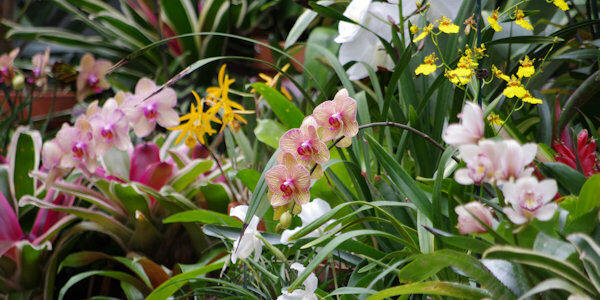 Head to the Conservatory (1/2 mile walk from House) and warm up in the tropical paradise! Don't miss the orchid section. If you want to take a longer walk, continue another 1/2 mile to the Bass Pond. Enjoy some solitude in the secluded Boat House. Return to your car and head toward Antler Hill Village and the Winery. On the way, stop for our favorite photo spot at the Lagoon. Look for the small lake on your left. There is a narrow unpaved road at the far end that crosses a small bridge and takes you around the lake for a stunning view of back of the Biltmore House (photo at top of this page). 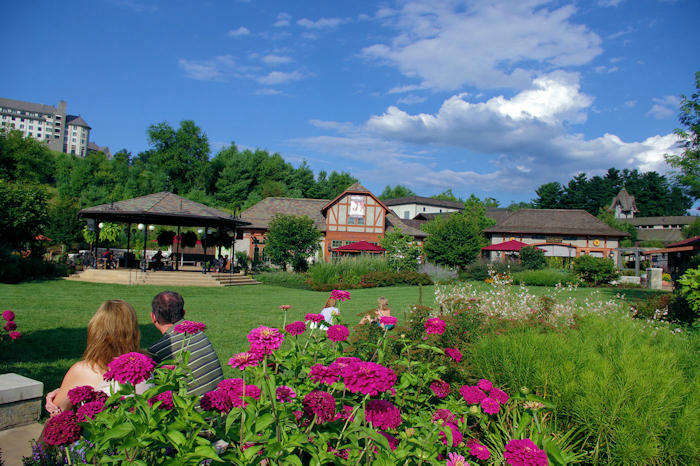 Antler Hill Village is a great place to unwind and take in the less formal side of the estate. Dine at Cedric's Tavern or Bistro. Tour the farm. Read more about Antler Village. While you are at Antler Hill Village, the Winery is a must stop. Warm up with a wonderful, relaxed tasting of robust reds, crisp whites and sparkling wines (included in your admission ticket). 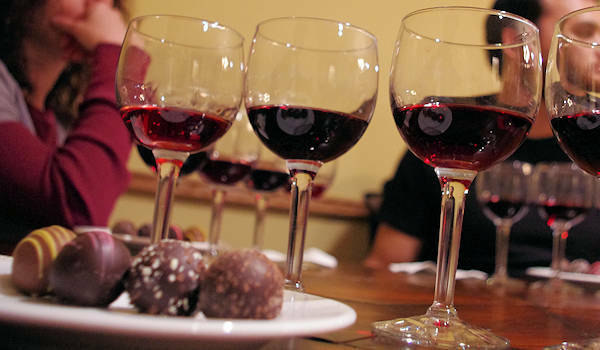 We especially love the Red Wine and Chocolate Tasting (extra charge). Read more about the Biltmore Winery. Romantic Spots: See the best places at Biltmore to propose or celebrate with your Valentine. Hike: There are many well-maintained trails to explore for all fitness levels. 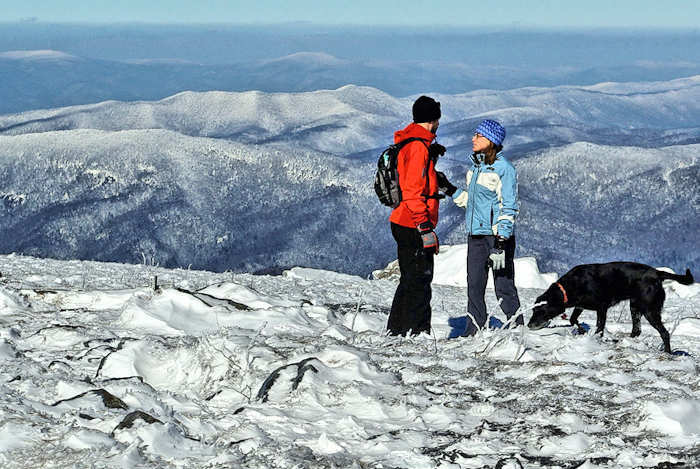 Bundle up and explore several trails. Our favorite is the Bass Pond and Deer Park Trails. 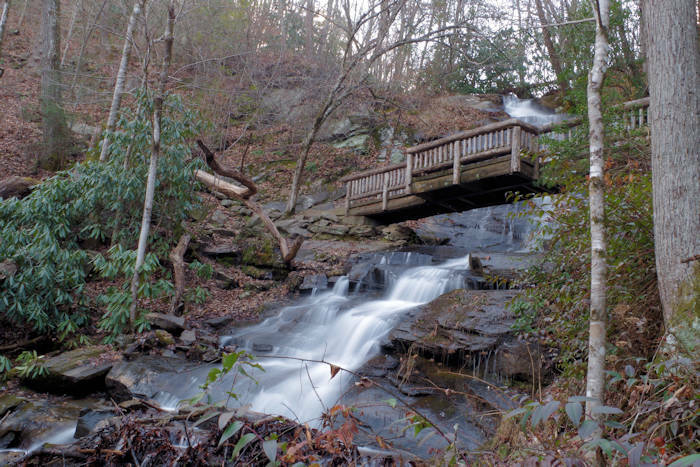 Read more about hiking at Biltmore. 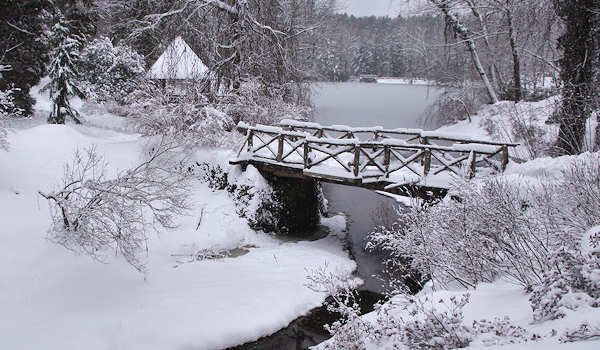 Snow: Since snow is rare at Biltmore (maybe a couple of times each winter), it's very exciting. Biltmore never closes - they plow and shovel immediately. Here are more ideas to create your fairytale getaway to this 8,000 acre estate. 1. Request a private carriage ride and cuddle under the lap blankets. 2. Enjoy afternoon tea at Inn on Biltmore Estate. 3. Have a fun adventure with the Land Rover Driving Experience School. 4. Stay for dinner. The estate's restaurants celebrate this romantic time of year with delicious menu offerings and an array of savory and sweet chocolate dishes. 5. Indulge in four-star luxury and romance with an Inn on Biltmore Estate romance package. 6. Saddle up for a guided horseback ride across Biltmore's ridges and pastures. 7. 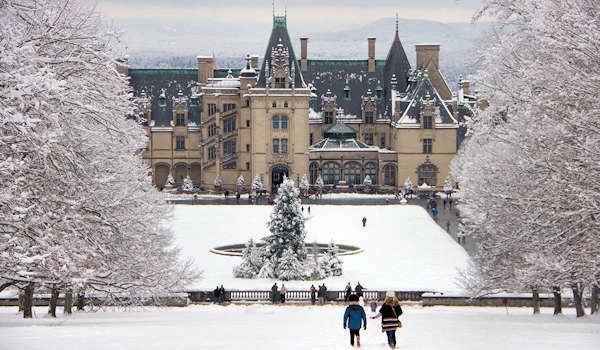 Combine your Biltmore visit with other great things to do... see our Top Asheville Winter Outings & Events. Read more about Biltmore's current deals and specials!